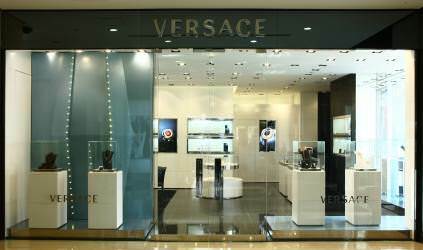 The 10th of December saw the opening in Beijing of the Versace Jewellery boutique, the third store – following those in Rome and Dubai – dedicated to the Versace Watch and Jewellery Collections. These are a collaborative venture between Versace and Vertime, the Swiss company that produces and distributes Versace watches globally. Vertime is a division of Timex Group, a leader in the field of watch making with over 150 years of experience. The new boutique, occupying 80 square metres, is situated within the China Central Place, the capital city’s shopping mall dedicated to luxury goods. The interior conveys exclusivity through the choice of precious and opulent furnishings, all created specifically for the store in Beijing: from the furniture to the walls in white lacquer and black leather. Large light boxes placed in the window displays, and smaller versions within the boutique, maximise the visual impact of the promotional imagery in store. A system of display niches within the walls highlights the collections on show to full advantage. This new Versace Jewellery boutique, representing the latest stage of our expansion in China, underlines the importance of this market for the Versace brand.